Top 10 Suckiest Enemies in Video Games! PBG's Super Mario Bros Super Show Episode 1 If you're new, Subscribe! → http:bit.ly1CaGyoOWant a shirt? → http:theyetee.compeanutbuttergamerYou will want pizza after watching this. PeanutButterGamer talks about a show from his childhood, The Super Mario Bros. Super Show! (Episode 1)Go here! 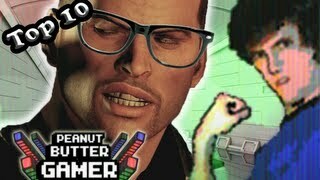 - http:normalboots.com----------Follow me!http:www.facebook.comPeanutButterGamer http:twitter.compeanutbuttergmr http:peanutbuttergamer.tumblr.comPBG theme: "Insert Title Here" by wilidacious! Alexis Ren Top 10 Hottest Videos!